There is an ongoing debate about whether hotels should bid on their own brand name. While many hotels have seen the benefits and bought into the idea of bidding on branded terms as a defensive strategy against OTAs, there are still many hoteliers who question the need to bid on their brand name. Looking at our clients on Google, which holds a market share of over 90% of searches across our clients, the numbers look a bit more sinister. So how do you get the most out of your brand campaigns? 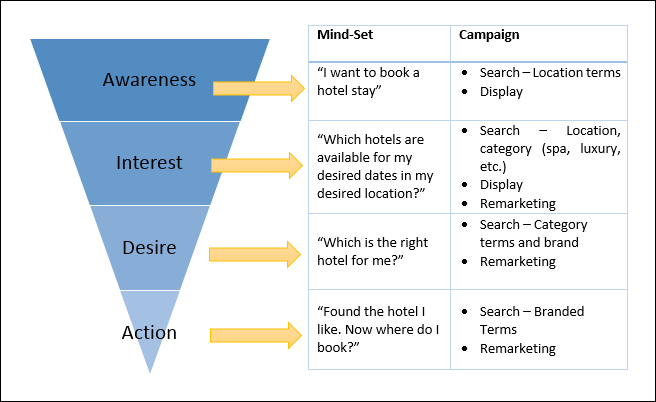 A shift in mindset is needed to fundamentally change the way you look at your marketing expenditure. Most hotels consider digital marketing spend on brand to be a cost center, and are assigning fixed monthly budgets to their campaigns, potentially restricting their impression share due to budget constraints and reducing flexibility for high demand periods. Don’t limit yourself to brand only campaigns. Travel shoppers look at over 20 sites before making a purchase.1Make sure you are present wherever possible at all stages of the funnel!